Protect your phone and enhance your mobile photography with the SNAP! 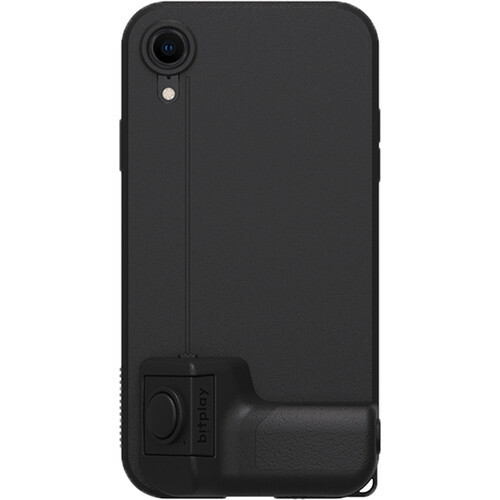 Case and Grip Bundle for Apple iPhone XS from bitplay. This bundle provides you with a protective case and the ability to more easily snap photos and record video. The case protects the entire iPhone with a soft TPU (Thermoplastic Polyurethane) inner layer, and a hard-shell polycarbonate outer layer. When you're ready to shoot, replace the streamlined grip on the back of the case with the included SNAP! Grip. The Grip transforms the sleek and sturdy case into a DSLR-like experience with a wireless Bluetooth shutter release. When attached, the SNAP! Grip gives you a chunky, DSLR-like grip to help make it easier to film and snap photos. The built-in shutter release button operates wirelessly via Bluetooth, and can be removed if needed. After initially pairing the grip to your phone, it will automatically connect each time you turn it on. With a full battery, the grip can last for approximately six months thanks to support for Bluetooth 4.1 power saving. Please note that approximately 200 snaps equate to an hour of connectivity. The SNAP! Grip also features a built-in standard tripod mount to give you more stability with an (optional) tripod, and can be used by itself on a variety of other smartphone models with a width of 2.3" to 3.3", and a depth of 0.5". The shutter release button can be removed from the SNAP! Grip, effectively giving you a small remote control for your smartphone's default camera app. As a remote, the shutter release can function from up to 33' away, and makes for an ideal solution when paired with an (optional) tripod for blur-free results. A flat, streamlined grip is attached to the back of the case via a screw by default, and is meant to give you a better handle on your phone when taking pictures or shooting video without the SNAP! Grip attached. The included SNAP! Grip gives this case a more DSLR-like feel, but your mobile photography experience can be further enhanced with (optional) lenses from bitplay. They offer a host of options that are engineered to fit right onto the SNAP! Case's camera cutout. You can select from a wide-angle lens, macro lens, and more. The SNAP! Case is easy on your pockets with a 0.6" thickness (without the SNAP! Grip attached) and 2.1oz of overall weight.